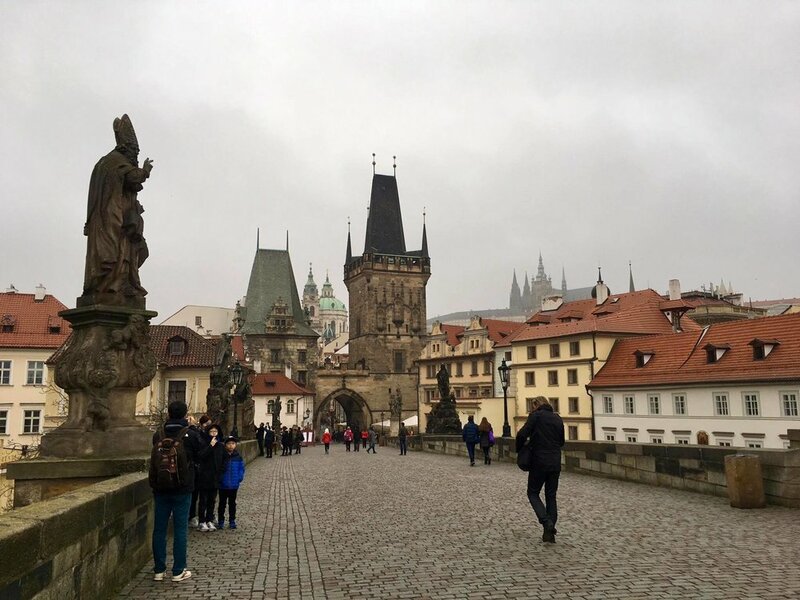 Though there were no clear skies during my visit, I was charmed by Prague's ancient buildings, much of it which has been preserved through its architecture that has survived multiple world wars. 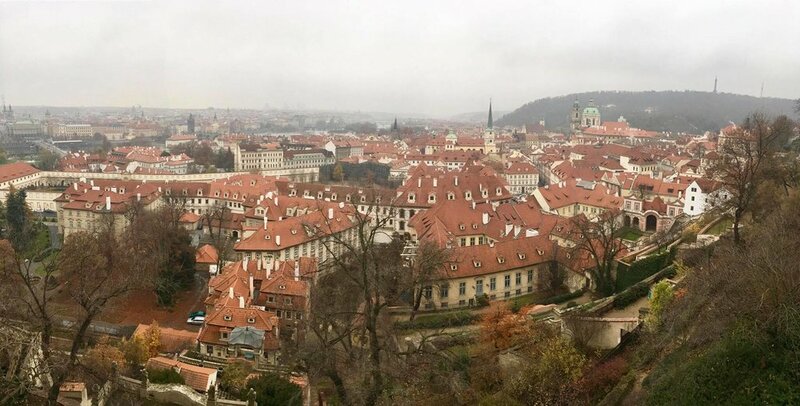 My day in the city took me from the Astronomical Clock in the Old Town, across Charles Bridge, and up the hill on to Prague Castle. This is slightly unorthodox, even for me, but I started the morning off with breakfast, and a meaty one at that. The reason for this is because the city's most famed butchery, Naše maso, often has lines out the door, and the only time to avoid the lines might be just as they open. Inside, its meat on meat on meat. 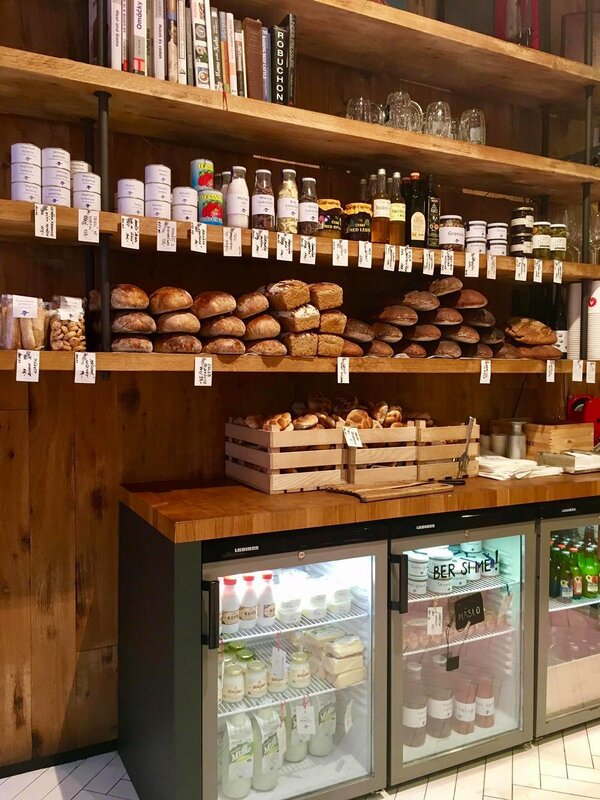 Fresh, locally-sourced, the butchery also cooks up dishes to be served right in the store. I opted for half portions of two favorites at the store, the meatloaf and beef tartare. The meatloaf, pictured below, came with a slice of thick-cut bread, pickles, and a healthy dollop of mustard. A perfectly balanced combination. I expected the beef tartare to have a gamey taste like most raw meats, but the store prepared it with spices such that there was no extraneous taste to be found. With toasted bread and a single garlic clove, also a simple and hearty dish. The eating area is adorably constructed, with a self serve drinks and carbs area and even a sink and dish disposal area. A platter of Prague ham, and various sausages unique to the Czech Republic (now officially known as Czechia, apparently). After a hearty (read: extremely filling) breakfast, I head back into the cold of late November and begin my walk around the city. My first stop was Old Town, which as its name suggests is the most historical part of the city. 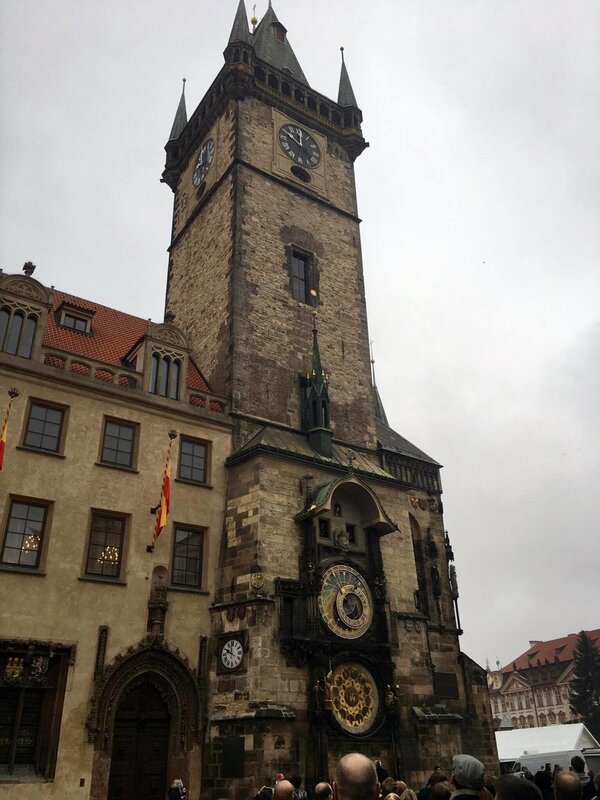 It's known for the famous Astronomical Clock in the Old Town square, which one can also ascend to the top of for a small fee. Choosing between the stairs and the elevator to the top (let's face it, when is that ever really a choice?). 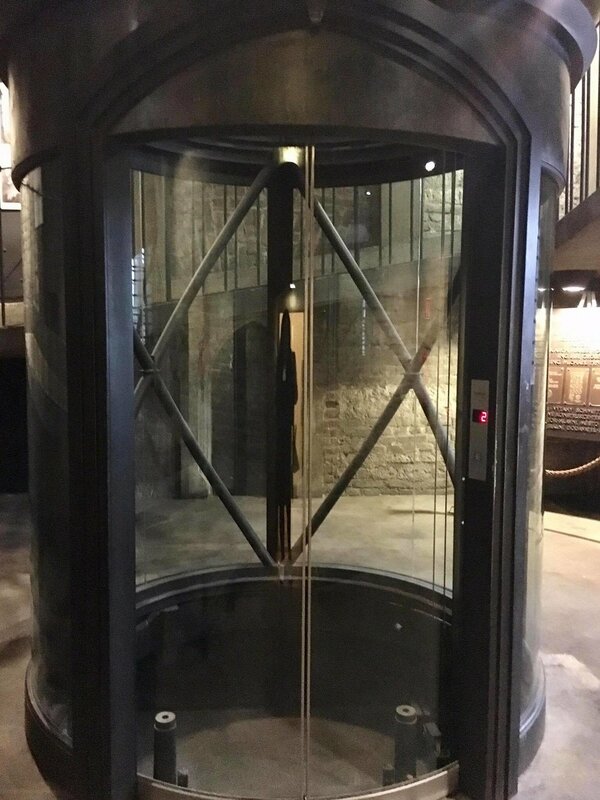 I was intrigued by the juxtaposition of such a futuristic elevator in such a historical tower. Church of Our Lady before Týn, the Gothic style of which is emphasized by the grey skies. 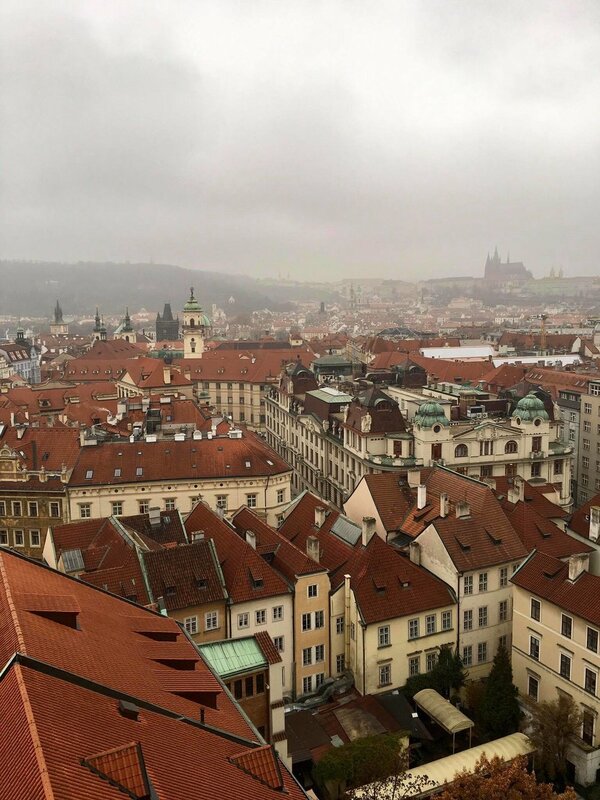 Old town, with an outline of the Prague Castle in the foggy distance. A shot of the surrounding walkway at the top of the tower. With construction of the bridge starting in 1357, it may be one of the oldest bridge I've ever crossed. Upon crossing the bridge, the Prague Castle is just a short walk away up the hill it sits atop of. I didn't find this out until arrival, but it turns out the castle itself is actually a complex comprised of many castles, as well as churches, and Golden Lane, known for being Franz Kafka's home during WWI. The interior of the cathedral, with its stunning arches magnified by its majestic height. A stunning stained-glass window off to one side of the cathedral. The eastern facade of the cathedral, though partially under construction, was still striking in its Gothic style. St. George's Basilica is the oldest church in the Prague Castle complex, dated from 952. Yes, without a 1 at the front. Golden Lane is situated at the very back of the castle complex. Known for its charming, doll-like houses, the lane was once home to many writers and directors. Many of the houses have also been converted to stores. I discovered one that sold a dearly beloved cartoon character, the Mole. After realizing the creator of one of my favorite cartoons from childhood was from a village close to Prague, I now, of course, had to feature him in shots of the city. Exiting the complex from the back, panoramic views of the city arise out of the fog. Finally, I descend the stairs towards the city, with a new friend in tow. 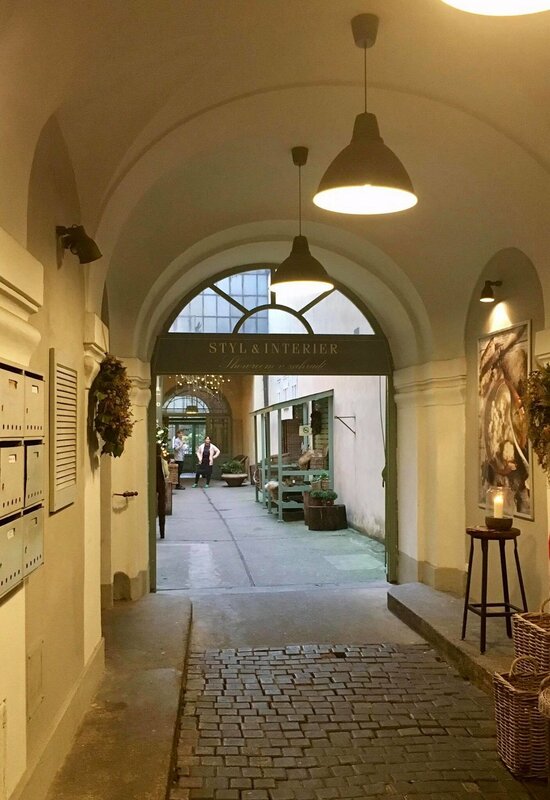 With a few hours to spare before my train departs for Vienna, I make a few culinary stops in both the Old and New towns of the city. This restaurant in a converted clock tower occupies the seventh floor. Though small, it serves up a mean Zelnacka, which is sauerkraut soup with cabbage, bacon, and sour cream. Warms the soul on a cold, dreary day. Pair the soup with something else the Czechs are known for, their version of open-faced sandwiches, or chlebíčky. Sandwiches in the middle tray are topped with beetroot puree, goat cheese, and walnut. The bottom try features sliced celery, mayo, tomato and parsley. A Czech favorite: prague ham, egg salad, and a pickle on the side. Adorably good. A cute cafe to rest one's feet is in the heart of New Town, in a historical building who's facade has remained untouched to this day. Styl and Interier's ancient exterior opens into a renovated interior with a garden, and some hearty local cuisine. On the right, a traditional Czech combination of mashed potatoes and stewed lamb. On the right, the ultimate cold weather cure, mulled wine. I didn't have this here, but I discovered the ultimate savory meal in Prague. Braised duck leg, served on a bed of red cabbage dressed with crispy onion strips, and a side of Czech dumplings, known as Knedlíky. Knedlíky is actually Czech for steamed bread, which is actually a much more accurate description for what it is. This version was soft, buttery heaven, and soaked up the sauce of the dish nicely. Don't pause to think of the calories when eating in this country, is my only advice. As I meandered through the city in a slow, satisfied daze, I came across a few interesting buildings and sites. The city of Prague is home to many gothic-style buildings, ancient or more relatively more contemporary. 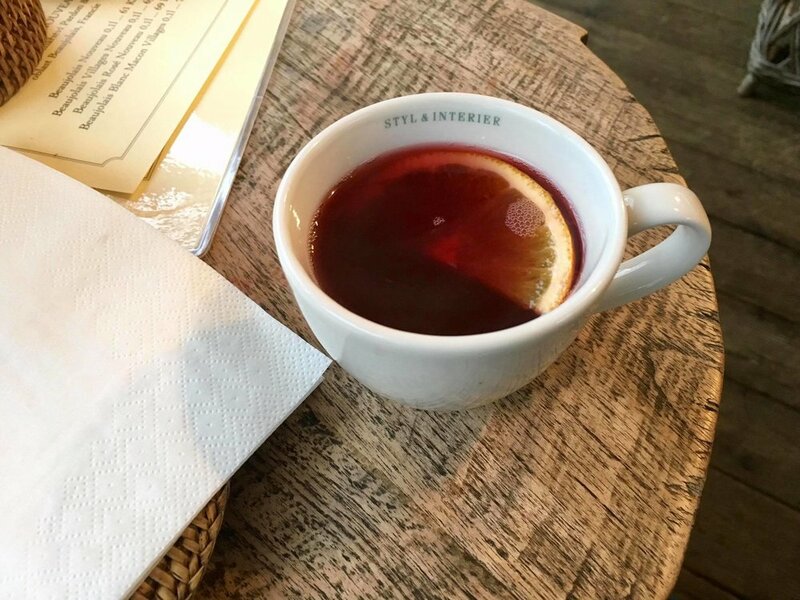 However, its also the home to a Cubist museum, which supposedly features a cubist cafe in which everything is curated with its namesake style. A worthwhile visit if one has the time, I am told. I happened upon David Černý's statue walking through a shopping mall in Prague. Made completely of styrofoam, it features the patron saint of Bohemians, Saint Wenceslas, on a upside down horse. The Franciscan Monastery and its adjacent gardens are an oasis in the middle of a often-busy city. Step in if you're in need of some refuge from the hustle and bustle, or just tired from walking. 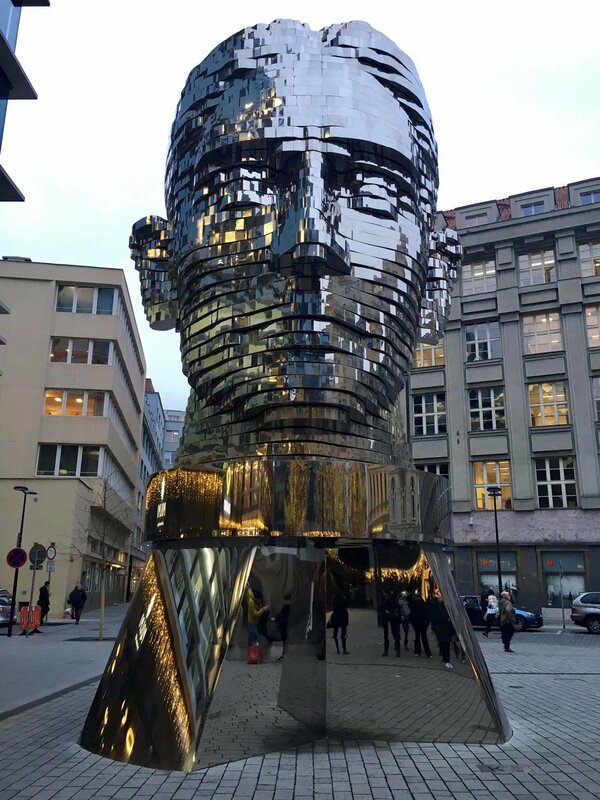 Last, but not least, the rotating statue of Franz Kafka. 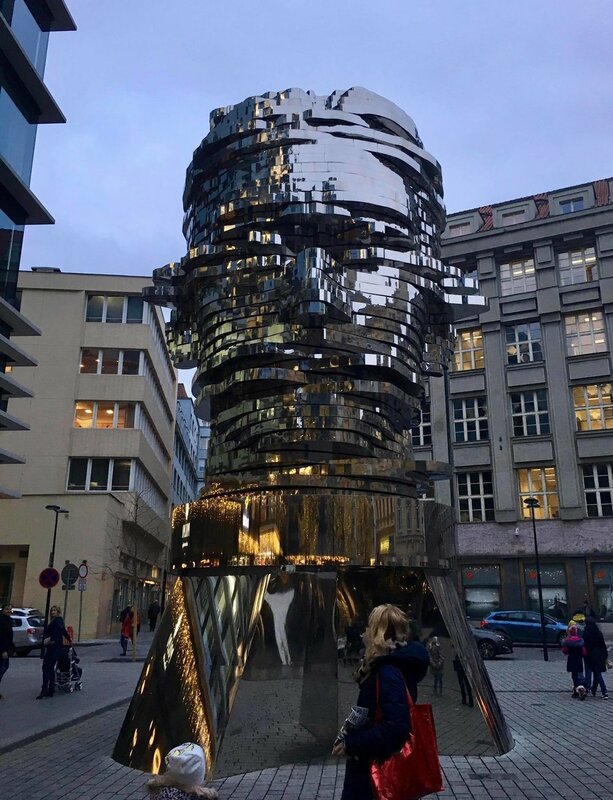 Don't quote me on this, but I assume the motion of the statue in constant process of becoming and unbecoming the author is symbolic of his acclaimed work The Metamorphosis. Somewhat dark, the novel tells the tale of a man who wakes up one morning to discover himself having transformed into a giant insect. As both he and his family struggles to come to terms with his irrevocable change, the underlying motif of humanity is constantly questioned, even as the man/insect meets his ultimate end via suicide. And that's it, my day in Prague. My itinerary was somewhat ambitious and slightly tiring for a single day, and two might be better suggested if one has the time.